An infant who's old enough to go outdoors is old enough to wear sunglasses. An infant who's old enough to go outdoors is old enough to wear sunglasses. "There's evidence that the ozone layer is no longer adequate to protect skin and eyes from ultraviolet [UV] light, and the damage is cumulative," says Stuart Dankner, M.D., a pediatric ophthalmologist in Baltimore and spokesman for the American Academy of Ophthalmology. "The earlier you protect babies' eyes, the lower the risk for cataracts or macular degeneration later in life." Julbo From the manufacturers of mountaineering eyewear: hinge-free, nonslip glasses for babies. $20. julboinc.com. 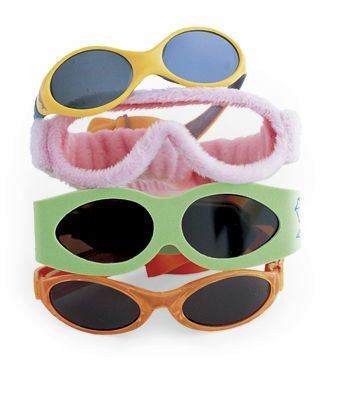 ParkerG's GooGoo Goggles Wrapped in soft, comfy fabric with elastic headband. $28. parkergrace.com. Frubi Shades Soft wrap-arounds secured with Velcro and made to fit infant-size noses. $10. frubishades.com. Baby Banz Australian wrap-around design with adjustable neoprene band; in eight colors. $15. babybanz.com.